Johns Hopkins has been standing up and managing onsite employee health clinics for almost 20 years. During that time, the focus generally has been on keeping employees on the job after a workplace injury. While that approach has been very successful, the clinic management team saw the opportunity, and the need, to provide a wider range of services, particularly around care management. And they knew just where to look. The clinic team decided to pilot two programs developed by the Innovations team at Johns Hopkins HealthCare Solutions: Managing Cancer at Work and DECIDE, a diabetes self-management program. Managing Cancer at Work is a low-cost, high-impact employee benefit program that enables organizations to help their employees prevent cancer, recognize the early warning signs of the disease, and understand and manage cancer treatment. This approach keeps employees informed, engaged, and feeling supported; many employees find it important to work because it keeps their lives “normal” while they undergo treatment. DECIDE (Decision-making Education for Choices in Diabetes Everyday) is the only self-paced, literacy-adapted learning tool that helps adults with diabetes improve self-management by developing their problem-solving skills and facilitating improved adherence to self-management behaviors. What makes these program offering work well within the onsite clinic is connectivity. 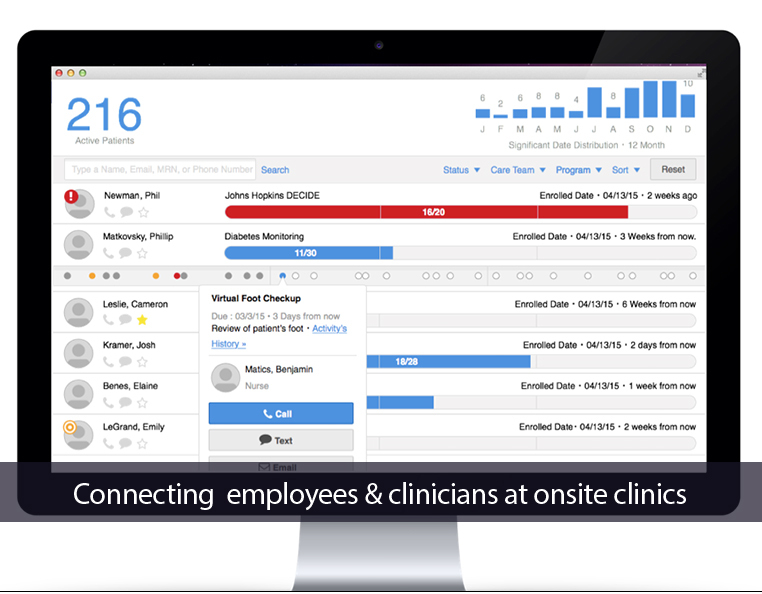 The Connected Clinic® is an e-platform that lets the clinician remotely guide, educate, and engage employees, using asynchronous two-way video, coupled with personalized and automated health coaching programs. Developed by technology collaborator ViiMed and adapted to the onsite clinic model, the Connected Clinic is integrated into a range of EMRs—including EPIC—providing a complete suite of tools for remote patient monitoring, personalized video coaching, and clinical decision support, which allows the care teams to have the right data to engage the right patients at the right time, regardless of when or where they work. Find out more about the Johns Hopkins Onsite Employee Health & Wellness Centers, the care management programs and the Connected Clinic. Contact Stuart Sutley, at 410-361-7828, or onsite@johnshopkinssolutions.com.